There are many memories I will treasure of my father, Robert Saucy, but I will write about only one now that has most profoundly impacted me—I believe, for all eternity. 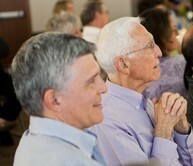 It was Dad’s passion for God’s Word. I remember that for the longest time as a kid I couldn’t accurately describe what my father did for a living. “Teacher” was how it came out most of the time. If I wanted to impress somebody for some reason, it would be “teacher of systematic theology,” but I didn’t know what much of that meant until maybe college years. But I do remember this … When I was about six or so, Dad came home from work one day with a load of books under his arms. He came in and set them all on the kitchen counter for a minute as he hurried off to something else. He didn’t see that I was watching, but before he left he carefully removed the Bible from the stack and placed it on top of all the other books. That one simple gesture spoke sermons to me—and has ever since. As Jesus told his disciples in John’s Gospel, these were words of spirit and life. And that’s how Dad took them in his life. I am the blessed beneficiary to say that my father lived with these words of spirit and life. 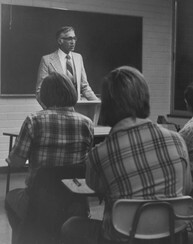 One of the best classes I had in seminary—and I have heard this from many others, too—was a course that my father taught with different ones of the faculty of Rosemead on “Theology of Human Nature.” The interface of psychology and theology in that course opened to me the Bible’s teaching of the heart. And it set me on a journey to work with God in letting His life-changing Word imprint and shape my heart and life, my mind, emotions and passions. I began that journey as a student, and I know my father was making the same journey as the course’s teacher. He would be the first to say that he came from a background where the Bible was taken quite cerebrally and cognitively. And he was good at it this way. What student overly zealous for a new truth or a half-baked old one didn’t feel the “walls closing in” under Dad’s Socratic questioning? Found myself in that posture a time or two, I should say. Somehow I always knew that it was “game over” when after a series of questions I heard him say, “so, what you’re saying is …” My position had serious defects usually by not attending sufficiently to some part of the Word. But the journey with the Word that I saw my father undertaking—and it lasted all of his life—was real, profound and heart-transforming. To the very end he was growing in knowledge of the Bible’s power and beauty, but he also allowed it to teach him vulnerability, openness and transparency. The Word of God was Dad’s passion. He let it claim his affections and will. He proclaimed its worth and he grew in its power all of his life. I will always hold this dear of my father, and take it as a call to my life. I so look forward to one day explore more the fullness of the Word’s riches together with him! I close now with my father’s thoughts from back in 2008. They were written for the Steadfast, Talbot’s Student publication at the time, and they are his better words of what I’ve been trying to say with mine. They represent what he lived and pursued all of his life, and they are what he would wish for all who read this post. 1. Attend to your heart. Like many (perhaps especially men) growing up in conservative evangelicalism (even fundamentalism) and seeking to do God’s will, I tended to evaluate success or failure in my walk by my behavior. Along the way I have learned more and more to look at my life by attending to the deep motives of my heart (cf. 1 Cor. 4:5). This has had the double effect of an increased awareness of sin—my old god-playing ego is still present and too active, and also, as a consequence, a much greater appreciation of the incomprehensible depth of God’s love and the amazing grace of his saving work in Christ in continually pursing and forgiving me. In short, I have come to experience more of the truth that John Calvin expressed at the beginning of his Institutes of the Christian Religion—the greater our knowledge of our self, the greater our knowledge of God and vice versa. 2. Treasure God’s word. The Psalmist testified, “O how I love Your law! . . . Your testimonies…are the joy of my heart” (Ps. 119: 97, 111). I cannot say that I have come to the place of the Psalmist yet, but I have begun to taste it. God’s word has increasingly become the pleasant food of my soul. Much change has occurred in the world and even in churches in my life, and the younger folk of today will see even greater changes in their lifetime. Without a relationship with an unchangeable God, there is nothing to keep us from being swept along with the tide of this world. As our personal relationships with one another are most importantly through words, so our personal relationship with our unchangeable God is through words—our words in prayer and praise through his living and powerful Word. Read it; meditate on it; memorize it; take time to hear His living voice. For we live “on every word that proceeds out of the mouth of God” (Matt. 4:4). Thanks to Daniel Eng, the student editor of the Steadfast at the time, for bringing them to my attention.